Wooden model cars designed with retro flair are stylish enough to leave out after the kids play. Made from solid Beech wood with rubber wheels, each automobile is solidly built and almost indestructible—and the sleek, glossy shape and vintage details are totally eye-catching, too. 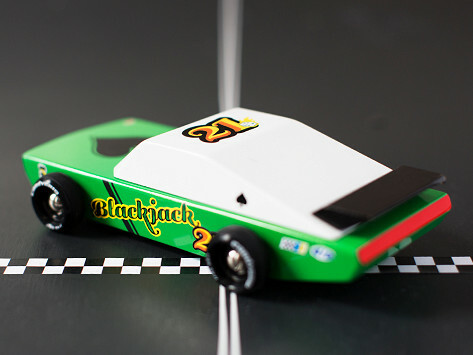 Dimensions: 7.2" x 2.8" x 1.95"
I recently purchased the Blackjack Race Car for my Grandson for Christmas. I was really excited when he opened it. It was cool looking and rolled so smoothly. My Grandson loved it. Unfortunately, a few hours later with limited use, it broke. The paint also chips easily. I was disappointed and my Grandson cried. This was a very disappointing purchase. These cars and trucks stand out from the other toys on the shelf, and the look appeals to adults and kids alike. Parents will like that there aren’t any pieces to break or lose and how artsy the cars are. As for kids, they’ll just love vroom-ing a slick-looking automobile around.